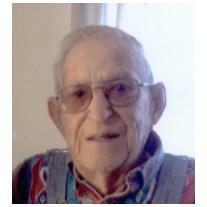 Wayne Gilbert Bachman, 98, passed away at home with family and friends on September 16, 2017 in Nampa, Idaho. He is going home to be with the Lord. He was born on January 13, 1919 in Glenwood, Iowa to Ray Maxwell Bachman and Ida Jones Bachman. Wayne served in World War II in the Air Corps from 1942-1945 where he worked on B-29 Bombers. He was very proud of his service. Wayne is survived by Ray (Mel) Bachman; Jennie (Marty) Stanley; Bill (Connie) Reed; many grandchildren, great-grandchildren, and great-great grandchildren. Special thanks to Hospice, Trevor Miller and Renee Drake. We miss you dearly and love you, Dad and Grandpa. Funeral services will be held at 10:30 Monday, September 25, 2017 at Dakan Funeral Chapel. Viewing hours will be Sunday between 5 and 7 p.m. at Dakan Funeral Chapel. Condolences may be shared with the family at www.dakanfuneralchapel.com.